PITTSBORO, NC – January 22, 2019 – Chatham Economic Development Corporation is hosting annual Opportunity Chatham meeting on Friday, February 22, 2019. The event’s keynote speaker will be North Carolina Secretary of Commerce Anthony M. Copeland, who will talk about North Carolina’s efforts in economic, workforce and community development. 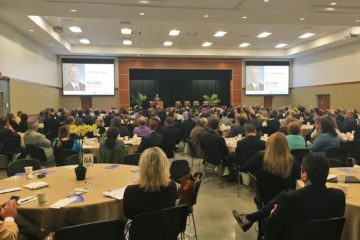 Opportunity Chatham, in its tenth year, is an annual gathering of community leaders to discuss the successes, strengths and challenges of economic development in Chatham County. The event begins with breakfast at 8 a.m. at the Chatham County Agriculture and Conference Center in Pittsboro, with the program starting at 8:30 a.m.
Tickets can be purchased online through EventBrite for $30. For more information and the generous sponsors who make the event possible, visit the event page or contact Chatham Economic Development Corporation at 919-542-8278.